Coyote Wall is a volcanic escarpment in the eastern Columbia River Gorge. I had seen it for years while driving on the Oregon side of the river. To me, it looks like the sloping end of a laminated layer of earth, and I always thought it looked like it would be an amazing place to hike or mountain bike. Somehow I never investigated further until recently. It turns out I was right; it is a great place for those outdoor pursuits. The day was almost perfect for hiking. There were blue skies, and the temperatures were moderate. I enjoyed open terrain with stupendous views the entire time. There were plenty of other hikers and bikers, but because it was open terrain, it didn’t cramp my style. I was too busy gawking in all directions and getting a decent workout. After forty or fifty minutes of uphill walking, I was skirting the edge of the cliff. The views kept getting better, but eventually, I decided to stop climbing. There was no official summit, so felt good turning around at a small dip in the trail, especially when I got a late start. Most others had stopped below. Jackie Chan the wonder dog took the opportunity to go nuts a little. What a treat to have continuous views on the descent! I veered into the area known at the Labyrinth, where the trail darts across a creek and along a few different undulating hollows between small crags. Perhaps because the terrain was not as lush as the usual environments around Portland and in the Cascades, each splash of green, each little rill, each colorful flower was a visual treat. This was a terrific place to visit, and I definitely want to return, perhaps with a mountain bike. 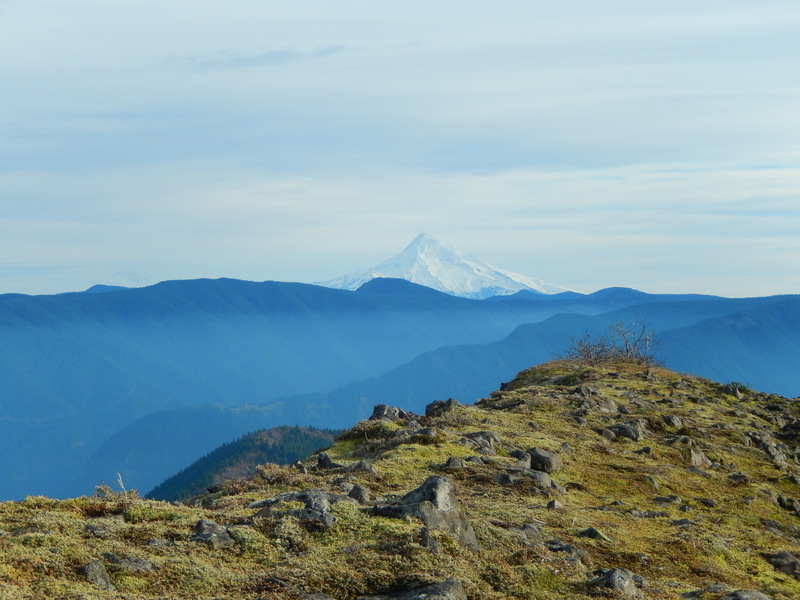 Coyote Wall is another reason for outdoor lovers to visit the wondrous Columbia Gorge. Sometimes when I leave the house for a hike, I don’t thoroughly prepare. Life feels too hectic to take an extra thirty minutes to check all my gear. I just want to be on the trail. Shocking, I know. Sunday was such a day. I threw on trail runners and my old worn out hiking pants, grabbed a backpack with stale water, leashed the pup, and drove to Lacamas Regional Park outside Camas, Washington. An acquaintance had said there wasn’t much reason to go hiking there, but I wanted to check. The map I found had looked interesting. Lacamas Lake is a long narrow lake with one developed trail along its southwest side. Although it’s pretty, I will admit that the lake looks rather ho-hum for hiking. Across the road at Round Lake, on the other hand, there is a whole system of trails circumnavigating the body of water and ranging into the woods beyond. loops A variety of casual and moderate loops are possible. The main round-the-lake trail is essentially an access road in many places. Offshoots, however, can be much more challenging, especially in muddy conditions. I encountered steep grade more than once. The park has three healthy waterfalls. That was a lot of white water in a medium-sized park. Shortly after leaving the dam at the outlet of the lake, I heard a bird of prey crying. It was way up a many-limbed snag. I tried to get a better angle and zoom in with the camera, but I was only partially successful. I could not identify its species, but I was sure it was not a red tail hawk, perhaps the most common raptor in our area. For a weekend, there was only a smattering of other hikers, mostly near Lower Falls, which is impressive indeed. It’s not a steep drop, but it feels massive from the footbridge across its lip. Beyond the popular areas, there were a few intersections with no signage, and the map didn’t quite match the world. I made an educated guess and plunged down a steep path to a muddy valley. It was a happy mistake, as I came upon Woodburn Falls, the third waterfall of the day. It was perhaps the prettiest of all, conjuring a smaller version of the famous Ramona Falls on the west side of Mount Hood. Lacamas Park had a full parking lot, but the crowds were well dispersed. A number of people were fishing, and some were birdwatching. I saw at least one mountain biker. This would be a great place to go for a run. The official lake loop is 1.2 miles, but with additional lops to waterfalls, you could easily add three or four more miles. This would also be a great place to canoe or kayak. 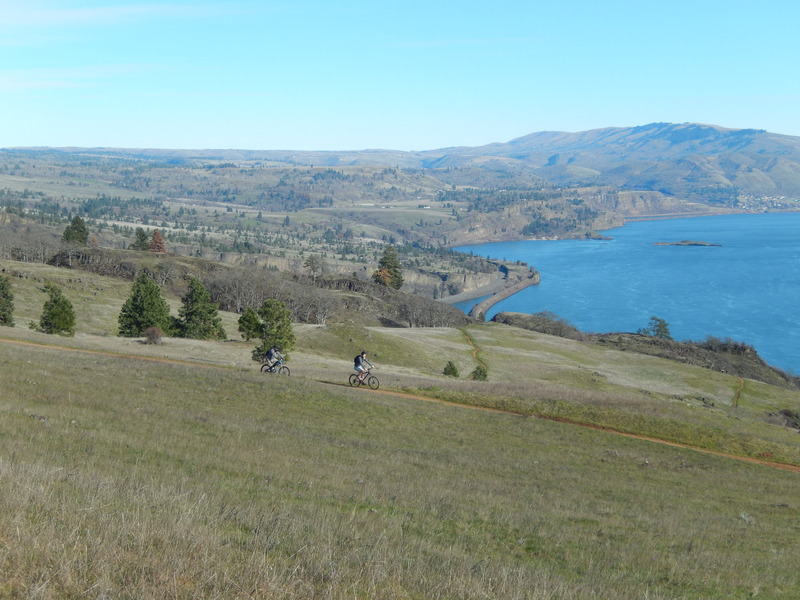 While the trail along Lacamas Lake itself may not be spectacular, there is plenty of exercise to be found in the regional park, so consider a visit. I had not prepared for much, so I certainly got more than anticipated. The weather had looked iffy early, but it was almost perfect until the end. I got some great sunny moments to light up green, gold, and brown of the ubiquitous moss. As I finished the lake loop, mist started to fall. Good timing. It was a perfect way to end the hike-almost as if I’d planned it. 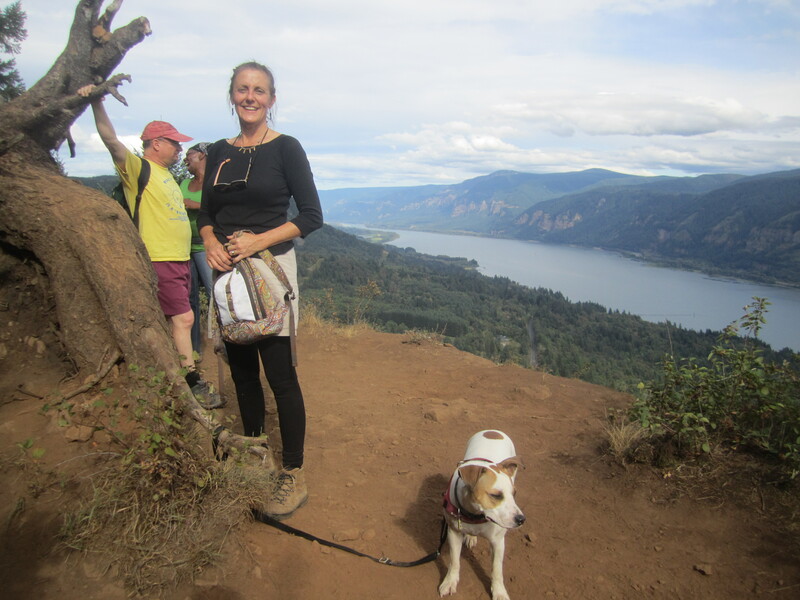 The Columbia Gorge is more diverse than some people realize. People who rarely stray from the Portland metro area are missing out on many worthy trips. The eastern end of the Gorge is drier, rockier, and more open, and trail signs there alert hikers about snakes, ticks, and poison oak. 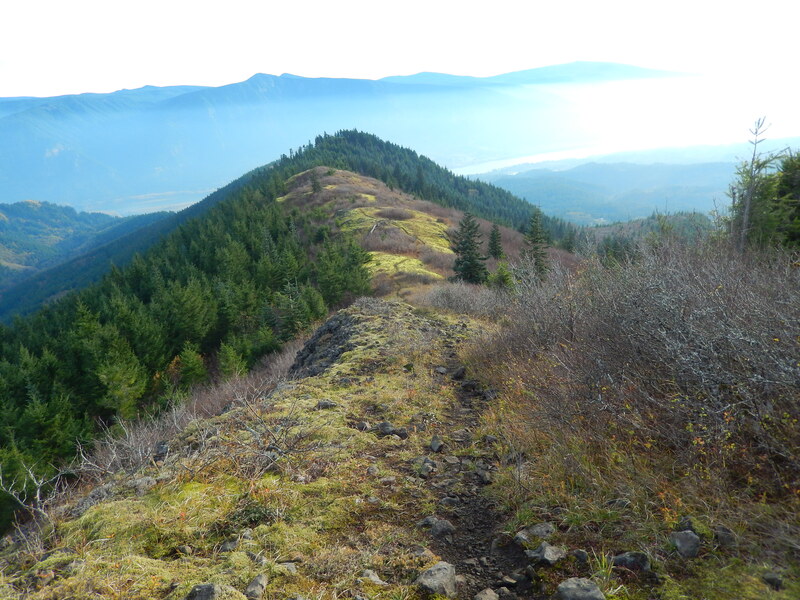 Unlike trails near waterfall central, there is a viewpoint every other switchback on trails east of Hood River and Bingen. I was reminded of this after the wife and pup and I drove up to The Dalles following our adventures along the Deschutes River . While sitting at a park chomping on some unhealthy food (sorry, Ma), I looked across the mighty Columbia (rolling on, of course) and I saw a massive basalt escarpment I’d noticed before. I mistakenly thought this was the Coyote Wall I’d heard of as a hiking and biking destination. It seemed a good spot for a hike, but we ended up somewhere else entirely. Life is like that. The Lyle Cherry Orchard trailhead is a broad pullout a mile or so east of Lyle, Washington. The trail itself begins right beneath a rocky tower. We knew we were in the right place because we saw dozens of cars. As it turns out, there is a group called Friends of the Gorge and they organize group hikes. We quickly met a couple dozen people descending the trail. Everyone was smiling—a good sign. We gained elevation rapidly, soon meeting the old roadbed of highway 8, a predecessor to the current highway. At a flat spot, there was a signpost with waivers to fill out, as the trail goes through private land. Fair enough. Above that, the trail switchbacks through scrub oaks and small crags, then comes out onto grassy benches rimmed with cliffs. 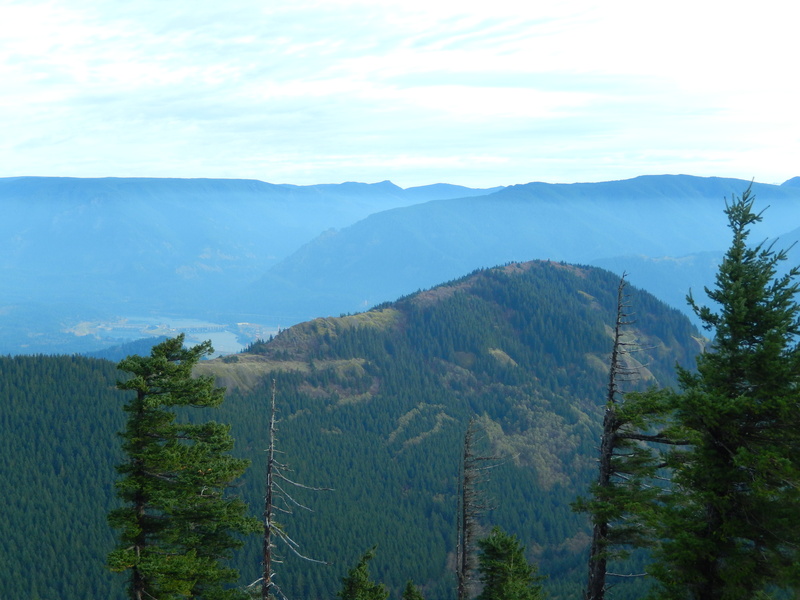 There are stellar views of the gorge, both east and west. Even with a few clouds in the sky, it was a sublime place to relax for a few minutes. The homestead. Note the cross. The trail shifts its approach, and beyond a stile, climbs steeply across an open slope. A fall here would not be pretty, so we didn’t fall. Coincidentally, I bumped into a man I knew from Portland. It was no place to chat, so we moved on, climbing out of the steep stuff into an undulating oak forest. No cherry trees yet. Along the way, the trail passed two seasonal ponds, along with a skull and skeleton of a critter. The last mile of the trail is rather humdrum in comparison to the first mile, but it’s still enjoyable. After turning onto an old road, the trail opens up in the meadow of an old homestead site which offers a great picnic spot. We found no cherry orchard, but there were more amazing views. Taking in the breeze, sun, and views was enough for us. Jackie Chan met a few ticks on the descent, which I quickly dispatched with ninja swiftness. Other than that, the hike was smooth, and we were happy to get back to the car and think about cold beverages. It was a very nice hike overall. People with less time could stop at the upper grassy bench and be very satisfied. This is a sequel hike. I came up here last winter, but a prime time summer day is a different experience, especially when it’s with four other people. we came late in the day, and just blasted (okay, we walked steadily) up to the first few viewpoints. We encountered a woman wondering if we’d seen a friend of hers. He had just taken off running. First rule of hiking club: don’t leave your buddies. Second rule of hiking club: don’t ridicule those hikers who make foolish decisions. We found the guy later. All was well. Third rule of hiking club: don’t scare the heck out of your friends by leaning way too close to the edge of a cliff. Ah, what the heck. We decided to turn around where there was a no trespassing sign that hadn’t been there in the winter. It would have been along walk to another pretty view and we were short on time. Still, a couple killer viewpoints and some good exercise with good company is about as good as life gets in my book. That and high quality chocolate ice cream.